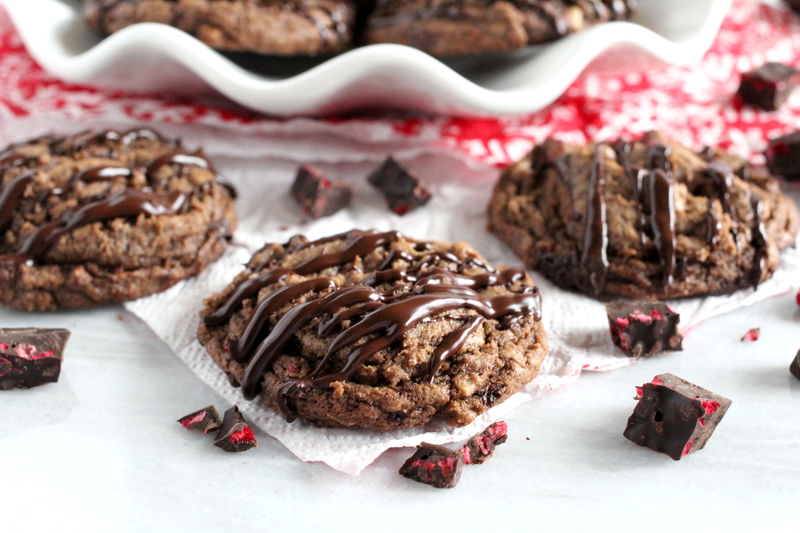 Chocolate Raspberry Cream Cheese Cookies…these delicious morsels are a chocolate lover’s dream! Are you ready to be engulfed with the lovely aromas of holiday baking? I love, love this time of the year and if you do as well then join me because in these coming weeks it’s all about the cookies in my kitchen. So put on some stretchy pants, preheat your ovens and lets start baking! I am getting you started with these outrageous Chocolate Raspberry Cream Cheese Cookies. They are by far the most soft and chewy cookies that I have ever baked and that’s saying a lot! What makes these cookies particularly chewy and moist is the brown sugar and the cream cheese which not only enhances the moistness but also gives the cookies another depth of flavor. Packed with both melted and dark raspberry chocolate pieces and topped with a drizzle of melted dark chocolate. 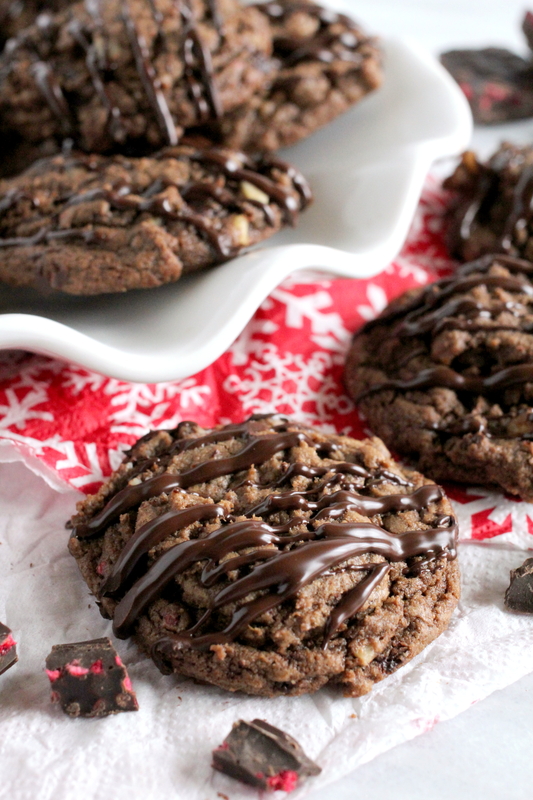 These cookies will have everyone drooling. If you can’t come across raspberry chocolate in your area then you can absolutely use regular dark chocolate chips. Just make sure it’s 70% dark chocolate or higher. Dark chocolate contains smaller amounts of sugar and a higher percentage of cocoa. The higher percentage in cocoa, the higher also in dietary fiber. Which simply means you can have more cookies…that’s my theory and I’m sticking to it…lol! As much as I love this raspberry chocolate, there are also other different flavored chocolates to experiment with. One other that I have tried and found quite delicious was pomegranate dark chocolate. Also intriguing is chipotle dark chocolate! On another note, this cookie dough is a soft batch dough. To keep the cookies from spreading to much, I chilled the dough for 1 hour. I then used a cookie scoop of 1 1/4 inch size to transfer the dough onto my baking sheet, alternately you can also use a heaping tablespoon. There is no need to roll the cookies with your hands unless you want smooth round tops. I love the rippled appearance of these cookies. Also, I baked the cookies at 350 degrees F. Using high heat would dry out these moist cookies. Most noteworthy here, I under bake my cookies. Yes I do! I’ve learnt to do this when it comes to drop cookies. When your cookies look firm around the edges but still moist in the center, pull them out of the oven. They will have a pretty hump when removed from the oven but leave them to cool on the baking sheet for about 5 to 7 minutes so that they don’t fall apart. As they are cooling they will continue to cook for a minute and slowly deflate somewhat. Once they are ready to safely transfer to a cooling rack, let them cool completely before drizzling them with the melted chocolate. As a result of not over baking these glorious Chocolate Raspberry Cream Cheese Cookies you will be rewarded with the most soft, chewy and ever so fudgy tasting cookie! And furthermore, have fun in your kitchen and don’t forget your stretchy pants…no seriously! Ciao! Until the next cookie!! 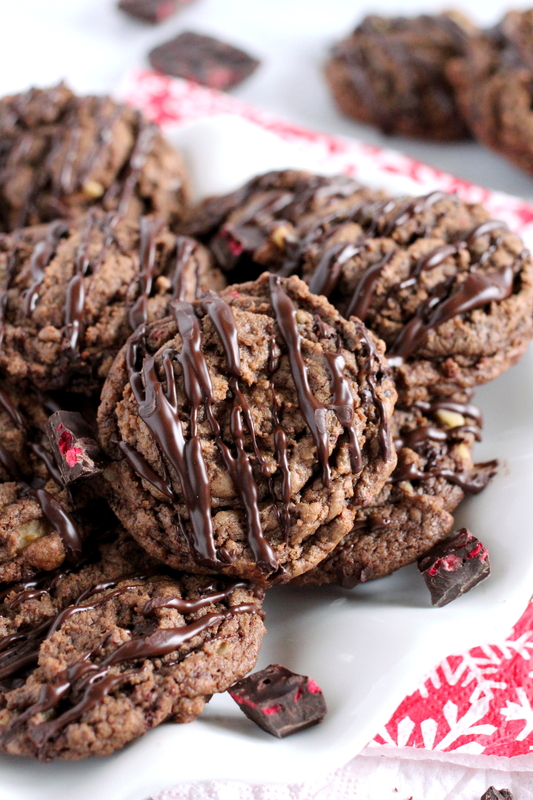 Chocolate Raspberry Cream Cheese Cookies. These cookies are soft, chewy and have a brownie like interior. A chocolate lover's dream. 3/4 cup melted dark chocolate pieces for drizzling. Line 4 cookie sheets with parchment paper and set aside. In a large bowl or stand mixer, beat together the cream cheese, butter, egg and both sugars until light and fluffy. Stir the 1 cup of melted chocolate raspberry and vanilla extract into the batter mixture. In a separate bowl combine together the flour, baking soda and salt. Stir the flour mixture into the batter until combined. Add in the chopped walnuts and the 1 cup of chopped chocolate raspberry pieces and stir to combine. Bake one cookie sheet at a time for about 8 to 10 minutes. Cookies will be firm around the edges and with very soft centers. Let cool on the cookie sheets for a few minutes before transferring to a cooling rack. 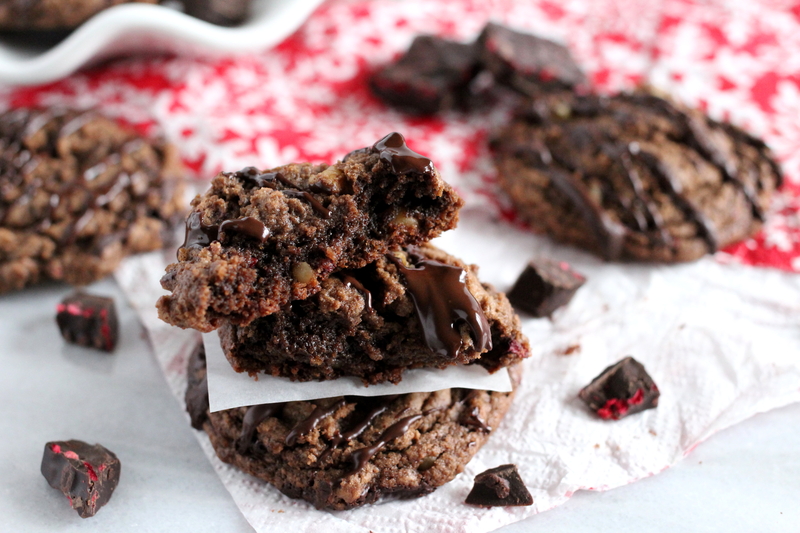 Once cooled, drizzle the cookies with melted dark chocolate. If you don't have 4 cookie sheets, no problem. You can alternate with 2 cookie sheets but remember to let the baking sheets cool complete before proceeding with the next batch. A wonderful addition to the holiday baking repertoire. Your tips and suggestions are the little nugget os information that insure success, thank you so much. The cookies look delicious, saved the recipe!! Yes, these are outrageously delicious looking! Your photos are gorgeous! Oh yum, Marisa! Stretchy pants, seriously! 😉 . 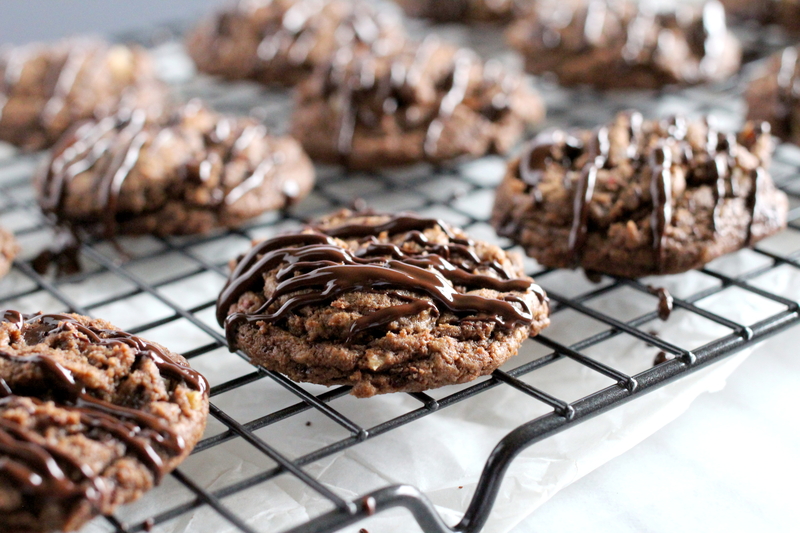 These cookies look so decadent and chewy, perfect for a dark chocolate lover like me. And if the chocolate is a raspberry dark chocolate even better. We have it in our pantry, I haven’t opened it yet. This could be a good use for it! Thanks for sharing, especially all the tips! 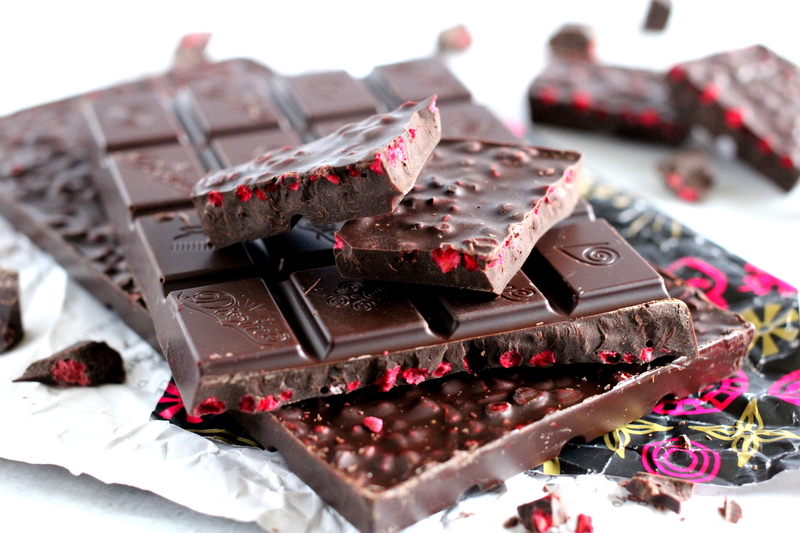 I LOVE the idea of using raspberry chocolate – anything that makes life simpler! I will definitely be looking for it 🙂 They look so decadently delicious! They are really delicious, thanks so much! ? Marisa, these look lovely. I especially like the dark chewy center. I just came across a raspberry emulsion in the store. I wonder if I could make my own raspberry chocolate by adding it to melted chocolate and chopping it when it’s cool. Just a thought. Nice post. Kim, I am sure whatever you come up with will be simply amazing! Thanks so much for dropping by? As a chocoholic, I must say these cookies look absolutely magnificent! They are pretty amazing, a friend just recently tried them and her son says they taste like Felix and Norton cookies….that’s saying a lot! Wow, Marissa! The recipe sounds really good but your photos seal the deal. I’m sure I won’t be the only person to be making these cookies this Christmas. Hi John, I’m glad you like them! They’re pretty simple to make and please both kids and adults. They disappear so quickly too…thanks so much? I just landed on your blog and saw about a half-dozen things I’m going to enlist my wife’s “help” in getting baked. This recipe is my early-on favorite to get made first. Perfect photos, descriptions. I might even be able to pull these off myself…nah, who am I kidding. Great site! Hi, I’m so happy to hear that you’ve found quite a few recipes to your liking and for leaving such a lovely comment. I have no doubt that you would most definitely be able to make these cookies, they are that easy and am sure you’ll get high praise simply for attempting the recipe. Enjoy!! ?